As a hint for how my scan turned out, my DEXA today and my pictures in the bodyfat estimation forum do not line up with those photos. Of course, there's a fair amount of error with even DEXA. As you always say, track caliper measurements over time. And of course, this is n = 1. Last edited by alcahuetej : 07-11-2014 at 11:52 AM. For some reasons I am not clear on DEXA seems to return higher values than caliper methods when you're looking at these types of pictures. It's something inherent to the method. I cannot wait till my calipers come in; first time I'll be using those...I have been doing the visual guessing method for years now...In any case looks like I'm somewhere between 15-20%. Thanks for the sticky this can help confirm some things for me. Low amounts of muscle mass can be deceiving as well. Skinny guy at 10% vs guy with 30lbs more muscle @ 10% will look way leaner. 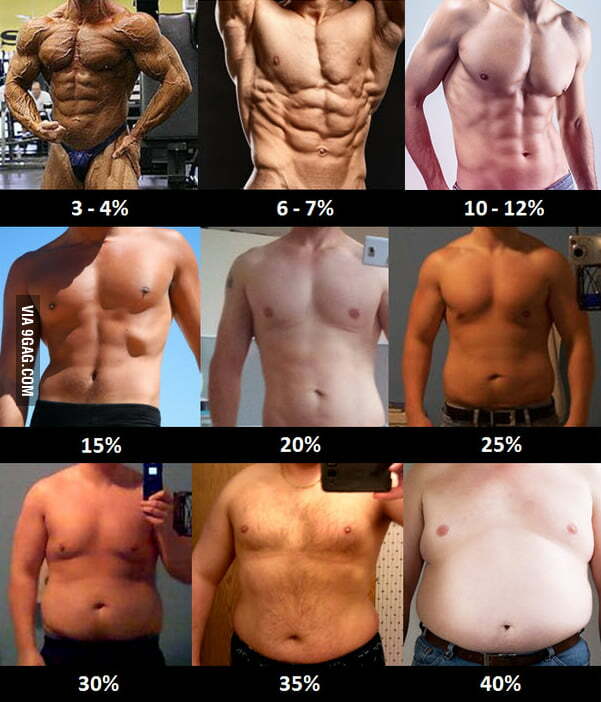 Well duh, 10% of a guy who weighs 200lbs is 6lbs more than a guy who weighs 170lbs. I've seen that graphic before and there really doesn't seem to be a huge difference between 25% and 20%, and especially between 20% and 15%. But eh it's good enough. Now that I got a set of the good calipers I don't worry about it as much anymore either, like everyone keeps saying once you get down low enough there's not enough of a difference between LBM and total weight that it matters as much when setting calories, protein etc.